Morah Katie: Do giraffes need to drink water? Olivia: Yes because everything needs to drink water. Morah Katie: Do you think giraffes like going to the water hole to drink? Lochlan: No because the lions. Morah Katie:Do the lions need to drink water. Jade: Yes because they need water too but the giraffes don't like to go when the lions are there. They have to spread their legs and bend down and then they can't see the other animals around them. 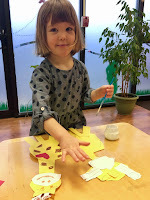 Maia: Giraffes don't like getting water because of the lions. 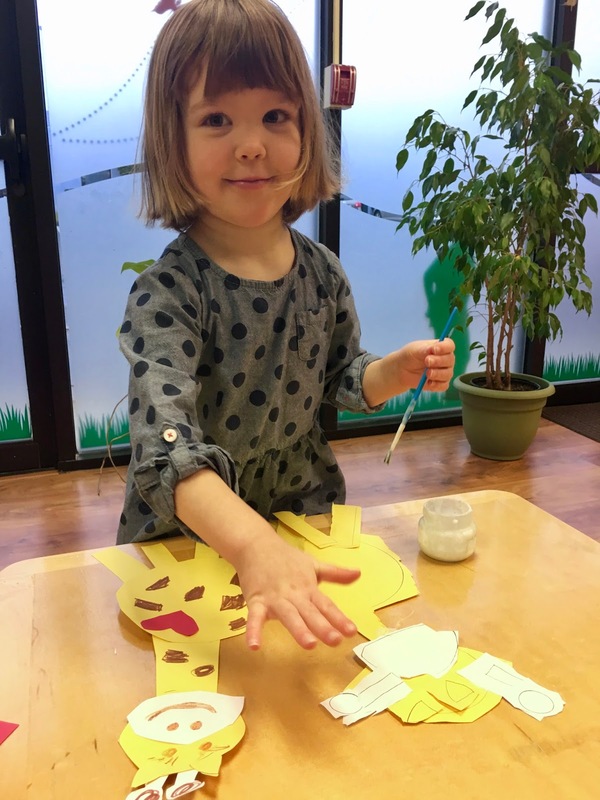 Morah Katie: Why do giraffes have spots? Mason: To hide them from predators. Morah Katie: What else do they use to help them keep an eye out for predators? Olivia: Their necks are so tall, their heads are up so high, they can look around. Morah Katie: What do giraffes eat? Sadie: They can reach and eat the leaves on tall trees. Morah Katie: Do they spend a lot of time eating? Morah Katie: Why do zoologists think giraffes tongues are blue, sometime purple or black? Lochlan: To protect them from sunburn because they are out in the sun eating leaves so much. 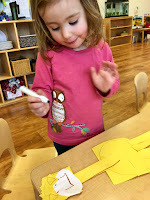 Morah Katie: Giraffes are tall. They can be as tall as 3 men high. Imagine your dad, now stack your dad on his shoulders, and again... he is already through our roof! That is how tall giraffes can be. They are big. They also have the biggest heart of all the animals living on land. Olivia: Wow that is enormous. Morah Katie: When you see this picture, what does it make you think of? Morah Katie: When we are kind and helpful how do we make people feel? 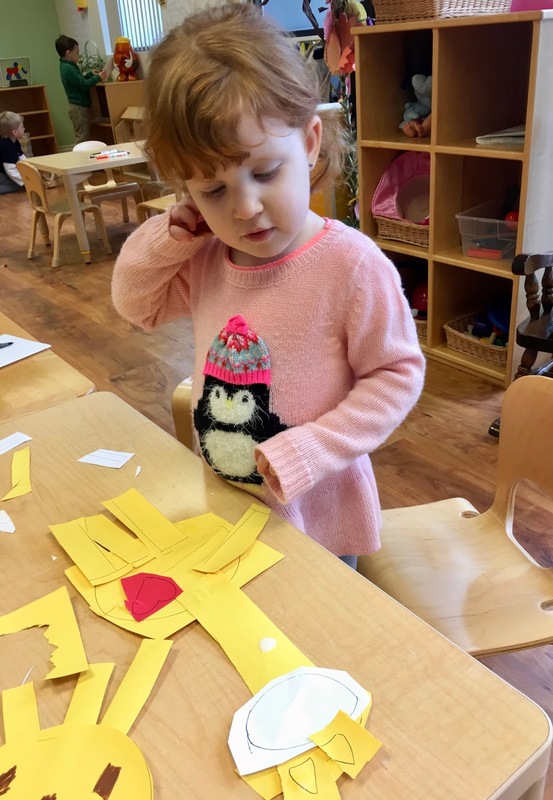 Morah Katie: We can fill our hearts, and the hearts of others so that they feel as big as a giraffes when we do kind things. 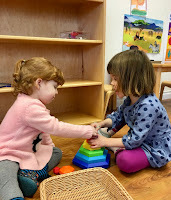 Matan: Emily shared her tzedakah with me to share. Morah Katie: How do you feel? Morah Katie: is your heart big and full like a giraffes? Morah Katie: How can you make your friend's heart grow big like a giraffes? Lochlan: Being love and doing nice things. Mason: Being thoughtful and doing kind things. Learning about the size of a giraffe's heart has helped remind us to use sweet, kind words and has inspired us to do many mitzvahs. Our "Mitzvah Tree" is already bearing fruit in time for Tu B'shevat, The New Year for Trees.